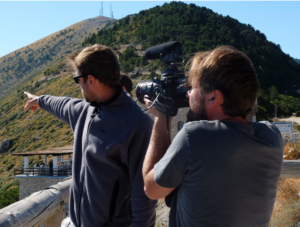 Passe-moi les Jumelles (Paju), is a legendary Swiss TV show, broadcasted on the Swiss French television channel (RTS).The episode programmed to air on the 6th of April will partially focus on the Octopus Foundation’s work in Albania. The Paju journalists have followed the archaeologists on the Orikum site in 2017, where they met with Julien Pfyffer and his team. As a reminder, the Octopus Foundation has a precious relationship with Albania since 2016. The Foundation’s objective was to support the excavations led by the archaeologists of the Geneva University (UNIGE). That first year, the Foundation has used its aerial drone to locate vestiges submerged in the neighbouring lagoon. Later, in 2017, the crew’s mission was to date these forgotten vestiges and define their purpose. This study allowed for a complete documentation which will help future archaeological expeditions aimed at digging and excavating the lagoon’s area.